According to this: What oil or fat to use for different purposes? For general pan cooking: olive oil (any kind), butter.. I see video from youtube such as How to Cook Steak by Jamie Oliver, he also used olive oil in a pan, but I am not sure if extra virgin is being used. Since for steak cooking, the temperature should be high, or should I use extra light olive oil instead? No. Steak needs be seared at a high, high temperature. Not only would extra virgin olive oil lose everything that makes it special at such a high temperature (so not worth the expense anyway), it would also burn. 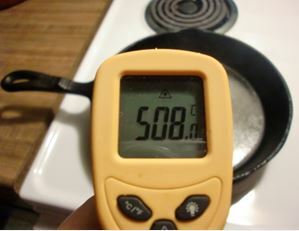 The smoke point of EVOO is 350F, 180C (give or take). That's simply way too low for searing steak. There is no such thing as a cooking oil that's hot enough to heat to what I would consider ideal steak steak searing temperature. No cooking oil can withstand that kind of heat. So how can you get away with it? Well, when I do it, first I remove the batteries from every smoke detector in my apartment and open my kitchen windows. Secondly, I choose a very refined (read that tasteless) oil with a high smoke point. By using a refined, tasteless oil, there's really nothing left after it burns to taste nasty; it just tastes like char, something I want anyway. Third, I don't put oil in the pan, I just lightly oil the steak. The method works great, but it requires a cast-iron pan and a high smoke point, neutral oil. I'm not crazy about Jamie Oliver's method because I like a serious char. You can tell he's not using extreme heat, because he's using a non-stick pan. I assume he doesn't throw away the pan with every steak. Even with his method, EVOO would be a bad choice of oil. The point at which extra virgin olive oil gets nasty is significantly lower than the temperature that will ruin a non-stick pan 400F+ (200C+), and much lower than the temperature necessary to get a decent char on a steak. Refined (pure, or extra light) olive oil would be an OK choice, as would canola, safflower, refined avocado, grapeseed or soybean. Heating extra virgin olive oil will break it down, losing the fruity qualities that are generally the reason that you select it over other types of olive oil. Although it'll work for cooking, it's not ideal, no matter what Rachel Ray would have you believe. (I typically use a virgin olive oil for cooking). I didn't think to qualify 'general pan cooking' by maximum temperature; I assumed it to be lower heat cooking, another fat I mentioned (butter) will burn when used in high heat cooking unless you clarify it first. ... but all of that being said ... I don't know what was done in the video, but you generally don't want to put oil in a pan when searing steaks; if you want to use oil, you're better off oiling the meat, then placing that into the pan. The high heat of the pan for a proper sear (higher than frying), will cause the oil to smoke and polymerize if you put it straight into pan, and it's not immediately covered by something to be cooked. Not the answer you're looking for? Browse other questions tagged oil steak olive-oil or ask your own question. What kind of olive oil should I use? Is this video showing an exception of the common wisdom that you shouldn't cook with EVOO? Difference between butter and olive oil?